Mahanagar Transport Private Limited has launched first hightech Metro Bus in Nepal. Altogether 39 buses will be launched in the initial phase. The cost of these 39 buses was NPR16 crore. The bus has been in operation since Sunday, 13th March 2016. For the first period, the hightech metro bus route will be inside Ringroad. The bus was started after an event organized in Vanasthali. include Free Wifi internet, LED Television, Location tracking system, Hanging strap for standing passengers, CCTV and many more. 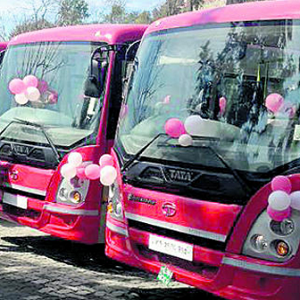 The company has created job opportunity to women by selecting them as a helper in the bus. Unlike existing buses, metro buses do not wait for passengers for longer time. So, it saves the valuable time of passengers. The company has said that they will soon expand their services to other cities according to the demand. Kathmandu needs more buses like these as these types of buses will attract the citizens towards public transport and it will reduce the use of private vehicle which is beneficial to country. The reduction in use of private vehicle means less air pollution and less number of vehicles and it will be easier to manage traffic if the vehicle is less in number. Since hightech metro bus in Kathmandu is enabled with mobile app enabled with location tracking system, people can easily know where the bus is heading towards, where the bus has arrived and the number of passengers inside the bus, people do not have to wait for hours for the bus at bus stop. They can easily choose the bus that they want to catch. All they need is to download the app in their smartphone. Enjoy the comfort and facilities of long route bus in short journey. With this bus, the days of boring and hellish journey is coming to an end. The only concern is that the hightech metro bus in Kathmandu ticket price must be within everyone’s reach.